THE BIG FEED - Filled full with a 16 oz jar of Texas Salsa (Texas caviar! 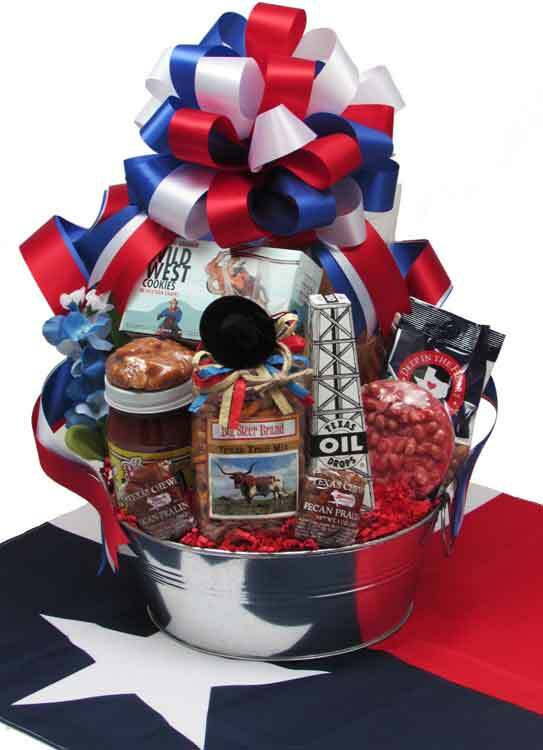 ), box of Peanut Brittle, Texas Trail Snack Mix (topped off with a cute felt cowboy hat & lariat), Chewy Pralines, Texas Oil Derrick (looks like, and is shaped like, an oil derrick. Filled with black jelly beans), Large Bag of Tortilla Chips (restaurant style), Gourmet Texas Two Step Popcorn (Jalapeno Cheddar & Caramel mix), Peanut Pattie (remember those?! ), Salted Peanuts, Hot Chile Peanuts, Creamy Dark Chocolate filled Wafer Cookie, and a White Chocolate Amaretto filled Cookie. Finished cellophane wrapped design beautiful handmade bow for hand delivery, approx. 19" h x 11" w in a 10" diameter galvanized bucket. For shipping, we design lower in the bucket, shrink-wrap and wrap with our signature burlap & Texas ribbon. The list of items above are what is in the design. There were a couple of items that were discontinued so we substituted with the items above. Photo coming.